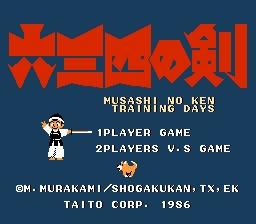 Musashi no Ken: Tadaima Shugyou Chuu is an action fighting game for the Nintendo Entertainment System. 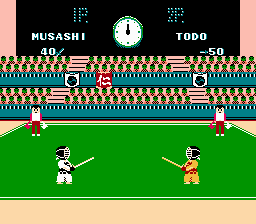 This is an English translation patch for Musashi no Ken: Tadaima Shugyou Chuu (”Musashi’s Sword: Now in Training”), a platformer for the Nintendo Famicom released by Taito in 1986. It is based on the anime adaptation of Musashi no Ken, an ’80s coming-of-age shounen manga about the son of two kendo masters and his trials and exploits through his childhood and high-school years. 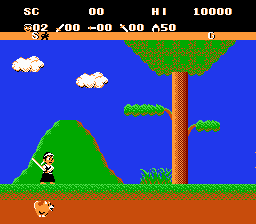 This game takes place in his early life and has you racing your pet dog through three platforming levels while dispatching various creatures and obstacles with your kendo sword. 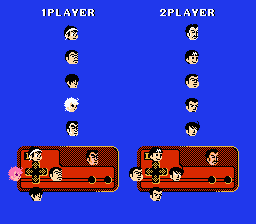 After powering yourself up in these levels, you move on to a kendo tournament where you compete against your rivals in a simplistic fighting-game format. 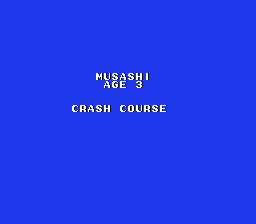 Like most platformers that came out immediately after Super Mario Bros., Musashi no Ken is a pretty rough game, with floaty controls and ceaselessly spawning enemies.